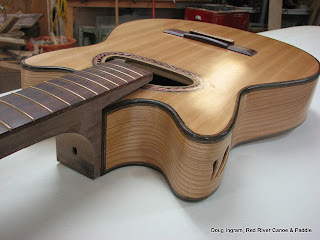 I've been making step by step progress on the guitars. 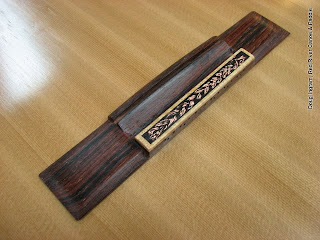 For my double cutaway, I have ebonized the bindings, inlaid the back, built up the finish, and made the bridge (simply laid in place for the photo) I will not be ebonizing the bindings of any future guitars! While the black is good, it is extremely difficult to keep a clean and precise look to the work. The back turned out well. 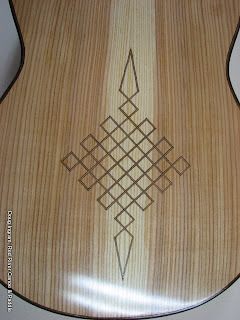 Once I had the idea in my head,"This inlay would look good on the back fo the guitar...", well, there was not way to get it out except to inlay the back. And the bridge. I started off by making a perfectly good tie block cap, then decided that it needed something to match the rosette, so MORE work! I'm glad, it looks pretty good.